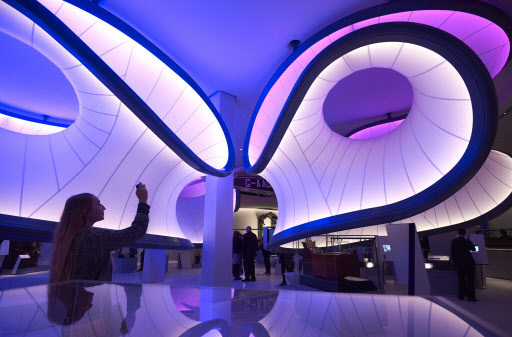 LONDON (AFP) - London's Science Museum called upon the genius of late architect Zaha Hadid for the “huge challenge” of bringing life to its new gallery dedicated to mathematics, which opens on Thursday. The Winton Gallery highlights the importance of mathematics through 120 objects, including a cash dispenser, the Enigma encryption machine, a model of a supertanker, a revolutionary aircraft and a 19th-century instrument for measuring tides. Located in a regenerated old wing of the famous museum, the gallery was co-designed by celebrated Iraqi-British architect Hadid, who died of a heart attack in Miami in March before the gallery’s completion. “It was a terrible shock for us all when Dame Zaha died suddenly in March this year, but I am sure that this gallery will be a lasting tribute to this world-changing architect and provide inspiration for our millions of visitors for many years to come,” museum director Ian Blatchford said Wednesday. Hadid and German architect Patrik Schumacher created the gallery around a 1929 Handley Page biplane hanging from the ceiling, with its layout and orchid-like lines representing the air that would have flowed around the aircraft in flight. “We want the people to see this gallery as a beautiful space,” curator David Rooney told AFP, adding it had been a “huge challenge” to humanize the subject of math. The gallery incorporates practical, occasionally comical, applications of math, including a machine that insurers used to calculate life expectancy before the age of computers, and another that helped bookmakers rapidly recalculate the odds on dog races. “We're telling stories about how mathematics is at the heart of everything we care about, from life and death, war and peace, money and trade,” said Rooney. “Maths is really hard, challenging, but also really rewarding,” he added.